1st time visit but office personnel and Doctor were friendly and professional. Easy to get to office and very acomidating.Great service! The service provided was great. I appreciate the extra work he did to get my medication to me. I would recommendhim to everyone. *Please note we are not currently accepting new Medicaid or Medicare Patients at this time* Dr. Dustin Kruse has been with Rocky Mountain Foot & Ankle since 2011. Dr. Kruse studied chemistry, sports medicine, and bioethics in Cleveland, Ohio at Case Western Reserve University until 2004. In 2008, he completed a Doctor of Podiatric Medicine degree at the Ohio College of Podiatric Medicine in Cleveland, graduating with high honors. Dr. Kruse is Board Certified in both Foot Surgery and Rearfoot/Recontructive Surgery. In 2011, Dr. Kruse completed a 3-year foot and ankle surgical residency at Highlands-Presbyterian/St. Luke’s in Denver, where he served as chief resident. 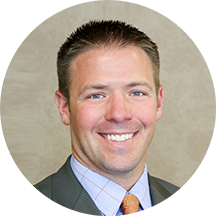 Shortly thereafter, Dr. Kruse joined Rocky Mountain Foot & Ankle Center. Dr. Kruse has had extensive training in ankle and foot reconstructive and trauma surgery, elective foot and ankle surgery, general podiatric medicine, and diabetic foot care and surgery. He also maintains an active role in academics as the research director and member of the Residency Committee of the Highlands-Presbyterian/St. Luke’s Podiatric Medicine and Surgery residency program. Dr. Kruse is Board Certified in Foot Surgery, and Rearfoot/Reconstructive Surgery. Born and raised in Marblehead, Ohio, Dr. Kruse remains an avid sports fan for his hometown teams of Cleveland. In Colorado, he maintains an active lifestyle, enjoying cycling, hiking, climbing, skiing, and just about anything outside! Does an excellent job. Very experienced and knowledgeable about wound care.